No battle has generated more myths or more conflicting analyses than Waterloo. How worried were they in Brussels, dancing at the Duchess of Richmond’s ball? What was Grouchy up to when he was needed? Was the French cavalry destroyed by a sunken road? Was the victory due to Napoleon’s state of health on the day of the battle? Was he misled by a local guide? Was a French general murdered after being taken prisoner? Should we really see the battle as a German victory? What did Cambronne say (and can it be printed)?Then come the issues about the aftermath – What happened to Napoleon’s treasures – and his famous hat ? Who cut down Wellington’s tree? Were local people compensated for the damage to their livelihoods? How did battlefield tourism develop? And how did Lord Uxbridge’s amputated leg become a diplomatic issue? This book, written for the occasion of the bicentenary, scrutinises these and other legends and stories with the aim of distinguishing the true from the false. 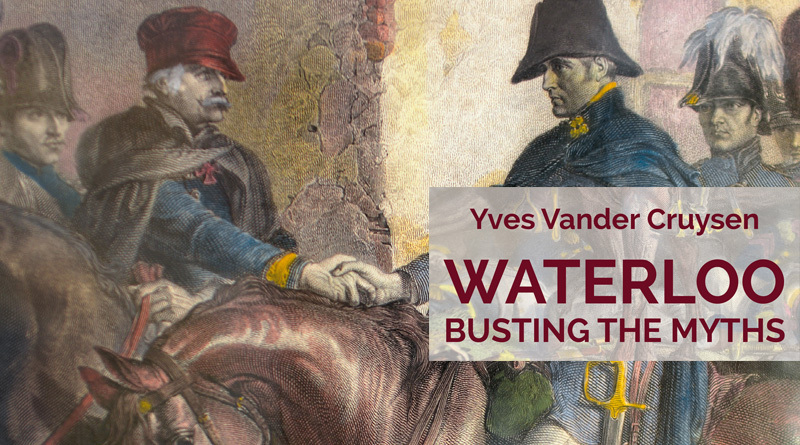 The author, Yves Vander Cruysen, has spent 15 years of study on and around the battlefield. He is also the councillor in the commune of Waterloo responsible for culture and tourism. His detailed local knowledge, besides his profound historical research, affords new perspectives and unique insights into many of these issues.